This restaurant drink recipe for an Espresso Martini was given to me years ago by a long time restaurant guest. 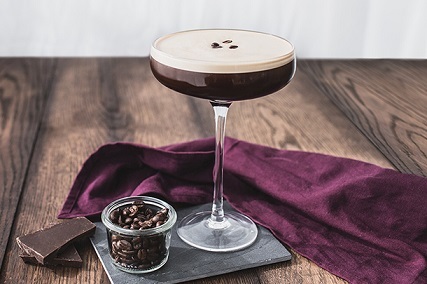 He said this was exactly the way he liked the espresso and vodka drink and wanted everyone to make it exactly the same way regardless of who was working. He even had a suggested price on the index cards, which was 25 cents more than what I had to charge to make the percentage. 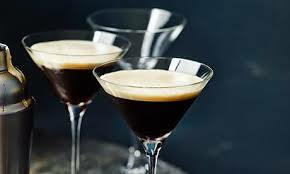 He always ordered this espresso-martini drink whenever he came in and soon had five or six other regular guests ordering it occasionally. They still do so today. Thanks, Howard! Preparation time: 4 minutes. Serves 1. 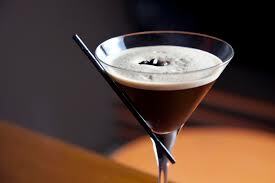 Enjoy your Martini with espresso and the company of those you share it with. And thanks again, Howard. You have a real restaurant recipe! Did you know? Espresso was apparently invented in Italy at the beginning of the 1900's by Luigi Bezzera of Milan who invented a method of making coffee with steam pressure. This method provided a quick way of making a single cup of coffee, "espressly" for one.